"The Church's Department of Immigration recognized that the issue of immigration was to be a long-term concern for the United States in the 20th century." Assembly Herald, March 1914. From RG 414: Miller, Kenneth Dexter. As many U.S. governors and presidential candidates have sought to shut off channels for the legal entrance of immigrants into the United States, the official response of the Presbyterian Church (U.S.A.) has been to remind the nation of our immigrant history and the humane standards that have governed the policies of this nation, particularly with regards to refugees from regions beset by political and ideological conflict. Mass migrations followed World War II and the conflicts of the Cold War, with millions of refugees entering the United States from war-torn nations in Western Europe and the Balkans, the Korean Peninsula and Southeast Asia, and Central America. Asylum seekers from Syria, Iraq, and other countries in the Middle East are the latest to seek safer and more secure lives on our shores. 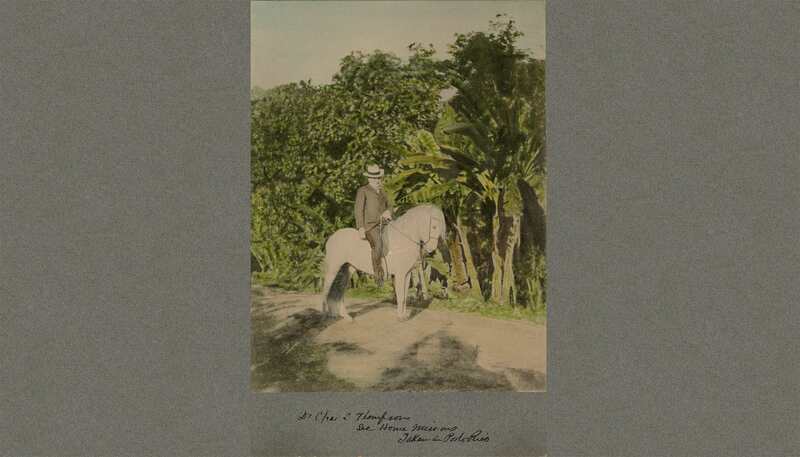 Board of Home Missions Superintendent Charles L. Thompson in Puerto Rico, from RG 414: Thompson, Charles L.
As the cities began to fill and push out their boundaries, it became evident that the Church needed a larger and more encompassing strategy. The Board of Home Missions leadership changed and a person of wider purview, Charles L. Thompson, became its superintendent. Thompson was called from his engaging ministry at Madison Avenue Presbyterian Church in New York City. A leader in the institutional church movement that expanded beyond traditional church ministry to serve the newly emerging needs of the city’s immigrant population, he backed up his concerns by appointing two people who became strong advocates for immigrants: Charles Stelzle and William Shriver. In 1903, Charles Stelzle began working in a new office, the Workingmen’s Department, the first such office in any denomination. Stelzle, the son of a German immigrant, used his working class roots to reach laborers with immigrant backgrounds. He was the first clergyman to address the American Federation of Labor convention, something he would go on to do for many years. William P. Shriver, from RG 414: Shriver, William Payne. Thompson recognized that the continual flow of immigrants into the United States needed an immediate response. In 1907, the PCUSA General Assembly, under pressure from the Board of Home Missions, organized a national program for ministries among immigrants. After a year of seeking “some one especially qualified by birth, training and gifts” to head the Department of Immigration, they decided to ask Stelzle. Under his leadership, the work of the Department of Immigration grew phenomenally over the next two years, and it was decided to separate the immigration work from the Workingmen’s Department. William Shriver, a Stelzle colleague for the previous nine months, was called as head of the Department of Immigration. Shriver, who took up his work at the Department of Immigration on November 1, 1910, had previously established an industrial parish among Italian immigrants in the East Harlem section of New York City. This was the same parish where Norman Thomas—in later years the perennial candidate of the Socialist Party—carried out his initial ministry. Despite the department’s work, and as the conservative church press of the day showed, some church members felt a lingering hostility toward new immigrants. 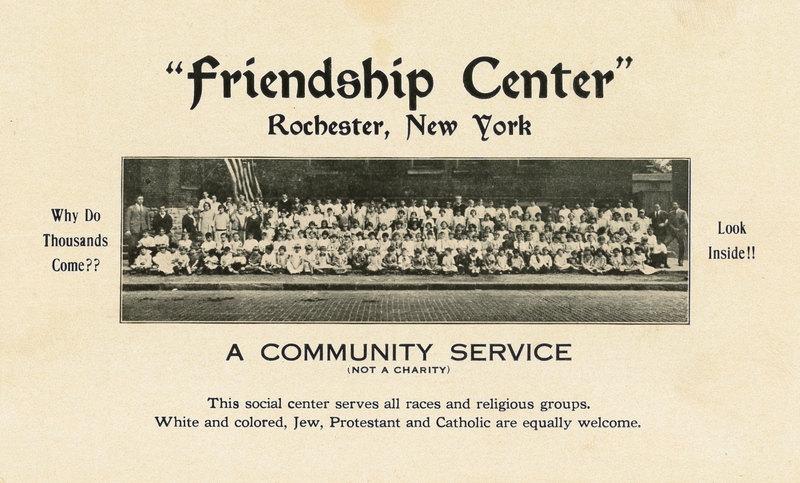 "Friendship Center" in Rochester, NY. From RG 307.1-10-32. Shriver recognized that the issue of immigration was to be a long-term concern for the United States in the 20th century. Under his direction, the Department of Immigration organized the Immigrant Fellows Program, which developed both a sensitive approach to immigration and the staffers skilled at relating to growing immigrant communities. The program would provide fellowships of $1,000 to seminary-trained pastors who agreed to serve in an immersion program of 18 months to 2 years of study and research in the regions of Europe where the majority of immigrants hailed from. The seminary-trained pastors, some of whom were recent graduates, would study the language and religious histories of their destinations. After their return to the United States, they would relocate to areas with strong cultural connections to their overseas regions. The work was to be carried out in a neighborhood house or an ethnic congregation, if such existed. Eight Immigrant Fellows participated in the program beginning in 1911. They were sent to Prague in Bohemia, Krakow in Poland, Budapest in Hungary, Zagreb in Serbia, southwestern Russia, and Italy. The program was cut short in August 1914 by the assassination of the Austrian Archduke Francis Ferdinand by a Serb patriot. The Austro-Hungarian Empire declared war on Serbia; Germany followed with a declaration of war against France and Russia. World War I had begun. Ralph Cummins, one of the fellows residing in Zagreb, was caught in the midst of the outbreak of hostilities. He made his way back to the United States in December 1914. The Immigrant Fellows Program, though short-lived, provided crucial and groundbreaking leadership to the work of the Presbyterian Church in the U.S.A. in its national church structure, neighborhood houses, and ethnic congregations. By 1914, three-quarters of the expenditures of the Board of Home Missions for immigrant work was spent in the congested urban centers of New York, Chicago, Milwaukee, St. Louis, Baltimore, and Cleveland. This work went on despite the changing climate toward immigrants following World War I. 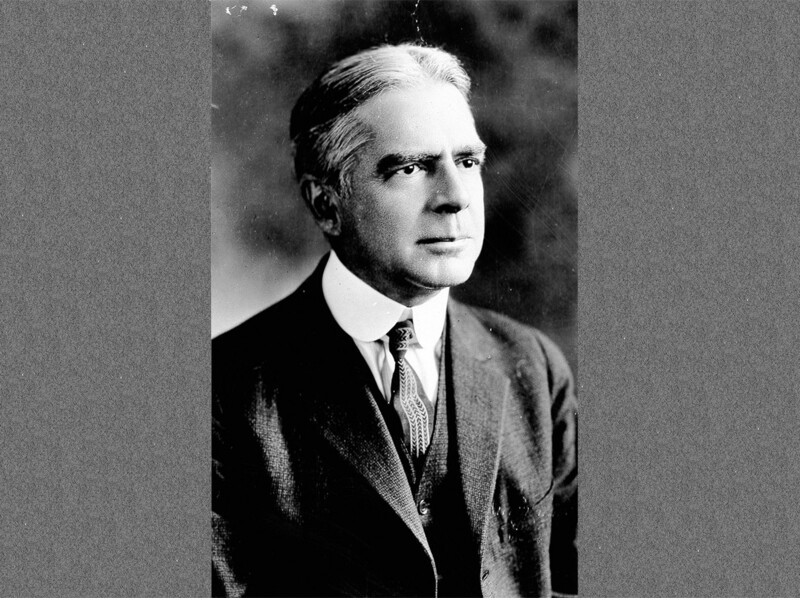 In 1921, the Department of Immigration attempted to revive the Immigrant Fellows Program under Kenneth Miller, one of the first Immigrant Fellows from 1911. The growing isolationism of the United States following its involvement in the First World War, and the fear of radicals arising out of Russian Bolshevism, bolstered calls to restrict immigration into the United States. Although anti-immigrant forces passed the Immigration Restriction Act of 1921, the Church’s Department of Immigration did not curtail its efforts to support and expand its ministry to immigrant communities already in place. In 1925, the PCUSA supported thirty neighborhood houses in immigrant communities throughout U.S. cities. In 1923, the Presbyterian Church in the U.S.A. reorganized again with the times. The Board of Home Missions changed its name to the Board of National Missions, and the Department of Immigration expanded and reorganized its activities under the name of the Department of City, Immigrant and Industrial Work. That same year, William Shriver, still a strong voice for the immigrant community, identified three institutional pillars of the Department of Immigration’s work that had been in place since the department’s founding: the foreign language church with a foreign-speaking or bilingual minister, the neighborhood house, and the English speaking church with a foreign constituency. 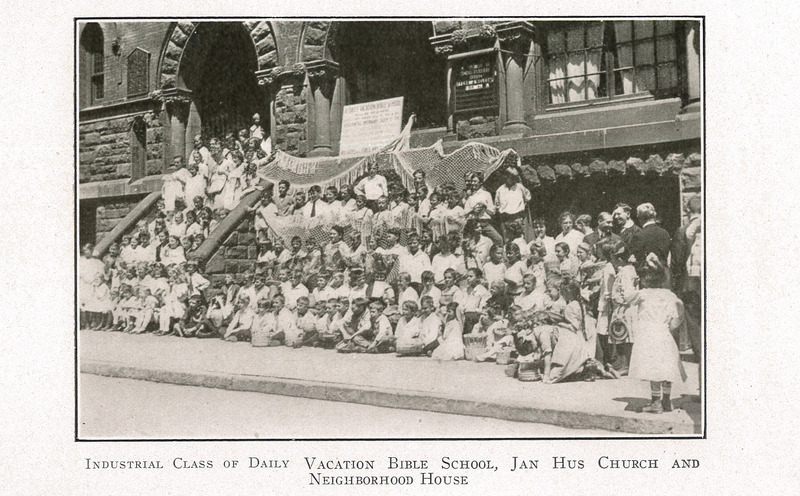 Jan Hus Church and Neighborhood House, New York, NY, 1917. From RG 301.7-10-49. Twenty five years later, in 1948, as Europe was recovering from the devastation of World War II, the 160th General Assembly of the Presbyterian Church in the U.S.A. spoke about another refugee crisis in Europe using these words: “The United States should pass legislation to bring in at least four hundred thousand displaced persons during the next four years….As they arrive, our church people should stand ready to open their homes and provide work for these unfortunate victims of war.” These sentiments carried forward in the ensuing years and engaged Presbyterians and their congregations, encouraging them to take action on the continuing numbers of people coming to the United States from areas of political unrest and conflict—a policy that originated in the work of the Department of Immigration. The historical records accessible at the Presbyterian Historical Society show how the PCUSA moved from its late 19th century wariness of immigrants to an openness and strong sense of responsibility about the issues faced by new arrivals in the United States. The spirit of individuals such as William Shriver, whose ministry in the national church lasted thirty years, was carried forward into the late 20th century and beyond. Today, in the 21st century, many Presbyterians are responding to the needs of those seeking a new home in the world with similar conviction. Long may we uphold this American tradition of welcome. For a more in-depth exploration of this topic by Reverend Poethig, read, "William P. Shriver and the Immigrant Fellows: A Presbyterian Response to Early Twentieth-Century Immigration," Journal of Presbyterian History, Volume 80, No. 3 (Fall 2002), pages 135-152. For information about ordering the Journal, click here. 8 hours 16 min ago. Today’s #HistoricalFigureFriday honors Reverend James Patriot Wilson. Born in 1769 in Lewes, Delaware Wilson went on to graduate from the University of Pennsylvania in 1788. He initially studied law and was admitted to the Bar but the unexpected death of both his wife and brother led him to a religious path. He was ordained as pastor of the Presbyterian Church in Lewes in 1804 and in 1806 he accepted a call to lead the First Presbyterian Church in Philadelphia. He resigned as a much celebrated pastor in the spring of 1830 before he died December 9th 1830. Our portrait of Reverend Wilson was painted in 1807 by none other than James Peale the younger brother of Charles Willson Peale. This oil on canvas painting represents one of the many large portraits James Peale completed after he shifted away from miniatures. To see more works by James Peale visit PAFA The Pennsylvania Academy of the Fine Arts or the Philadelphia Museum of Art.